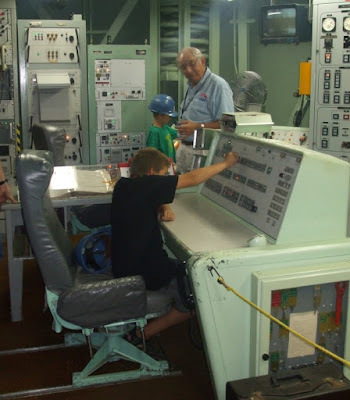 "This is our missile combat crew commander," the tour guide pointed to my eleven-year-old son, "and this is our deputy missile combat crew commander." the tour guide grinned and put his hand on the shoulder of my tow-headed, buck-toothed eight-year-old son, "He looks about the right age for an enlisted man." We all laughed. The tour guide stepped back and raised his hands like an orchestra conductor, "Now when I count three, both of you turn those keys and hold them while I count five. Ready?" My sons both nodded their heads. "One, two, three." My sons turned their keys and then waited until the count of five was up. The keys were in different control panels, too far away for one man to reach both, and they had to be turned at exactly the same time or the missile would not launch. It was one of many fail-safes in the Titan program, a way to make sure no one man could make the decision to launch a nuclear missile. "One, two, three, four, five. Did you do it?" The tour guide peeked over the control panel, then pointed when the light came on. "You did it. Now you just watch those lights." The lights on the control panel lit, inexorably, one after the other. When the third one came on, an ear-splitting alarm bell made us all jump. The tour guide quickly shut it off. Another light, and then a horrible buzzing noise. The missile had lifted off, headed towards a target that no one on the crew knew anything about. "Now after the launch," the tour guide said once he had turned off the buzzing noise, "We were 'sposed to wait down here for further orders. We weren't exactly sure who those orders were 'sposed to come from," he raised his eyebrows, gave us a mischievous glance and pointed towards the ceiling, "Because if this missile had to be launched we knew that meant everyone up there wasn't going to be in very good shape." We all laughed again, then headed upstairs to look at the cramped crew quarters. A small room with bunks, a kitchen, and a shower which the tour guide said, "No one ever used." "Maybe on your crew." one of the tourists jabbed. "No one ever used it because no one wanted to clean it." the tour guide shot back merrily. As I walked down the cable-way to the missile silo itself an immense feeling of gratitude came over me. I grew up in the shadow of the cold war. When I was the age of my eight-year-old son, these missile silos were still in full operation, ready any time day or night to deliver our end of mutually assured destruction. But we never had to use them. Humanity won the cold war. Sanity prevailed. "Thank you for the tour," I said to our tour guide when it was all over. He was a former missile combat crew commander himself. "I was just glad I could bring my children here and show it to them as a museum." The tour guide laughed. I could tell he knew exactly what I meant. "Its good that it's a museum," he agreed. He was so kind and funny. I wondered if the missiles had been launched, would the Soviets have any idea of what sort of man had been asked to turn the key? What sort of men and women were in the Soviet missile silos? Were they cheerful and friendly too? "We never had to use it, and its thanks to you," I told him. "Well, I hope not," he looked down. I hoped I hadn't embarrassed him, but that's the way I felt. The courage and the readiness of those missile crews made it possible for me to be showing my children their weapon as a museum piece. It was a weapon so good that we never had to use it. If those missiles had been launched, none of us would be in very good shape. What a great story! It really does make me feel safe! I grew up in the cold war climate, and reading this entry on your blog has caused me to ponder some of the psychological affects, such as my gut instinct to not trust anyone. How wonderful it really is to see a generation growing up in a more open environment! Yes, the world will always have its problems, but living with the constant threat of possible immediate and total annihilation was not fun. Wow! Look at those computers! How remarkable, and what a great experience for your children. By the way, where's the second chapter?????????????????? Oh, Mati, don't you want to wait and read the whole thing when it is all done? Nicely put. I'm looking foward to the whole novel now. Man. What a dream come true for your boys! You are a cool mom. Boy that sounds like a lot of fun! How exciting to go see the real thing.